Here’s a statement, and you identify whether this is cutting-edge green building theory or a pioneer sentiment promoted by our great-grandparents: We should approach construction, renovation, and the operation of our homes and buildings in a healthy, energy-efficient manner and conserve resources. Maybe both? While there is a lot of buzz and a fair amount of confusion about what it means to build sustainably or green, the values behind it are straightforward. People build green homes because they are healthy, they use fewer resources, homes have a longer life because of quality build practices, and buildings save considerable energy. A movement toward green building in Flathead Valley is gaining momentum, propelled by the hope of committed entrepreneurs trying to make change, the deeply rooted local values of respecting and conserving the land, and experienced professionals eager to embrace a new and different future for the built environment. Different from the past, this new movement is employing some exciting technology and new materials and financial incentives are propelling more favorable economics. As people recognize how their personal decisions have broad ramifications on the Earth’s resources, a number of forces are coalescing behind the green building movement. The United States’ domestic oil supplies have peaked and are on the downside, forcing more reliance on foreign sources. With less abundance and world competition for the remaining quantities, prices are rising. At the same time, evidence is mounting to demonstrate that fossil fuel use is behind green house gases and planetary warming. Green building is one answer for lowering this high level of consumption. Buildings can be green as a result of goals or intentions of the building programs, and there are independent certification programs that verify that the building and the process has met a set of standards for green building. The explicit certification standards vary by the agency making the certification and by the level for which the building is being certified (such as silver, gold, or platinum). Green building goals benefit the health of the building’s occupants through better air quality and less toxic materials; they benefit the community by lowering infrastructure requirements; they enhance the value of the building, and lower operating and life-cycle costs; they result in lower water and power use; and they support a better environment by conserving natural resources and protecting ecosystems. In the Flathead Valley, support for green building came concurrently from a number of directions. One was the Green Building Guild, which got its start a few years ago when a group started meeting informally to talk about how they could build differently, better, and in accordance with their personal values. “We were seeing things built that just didn’t perform as well as they should, and we were talking about healthier, energy-efficient buildings with solar design,” recalled Dave Fischlowitz, member of the Guild and owner of Fischworks, a green design concept center and green material source. 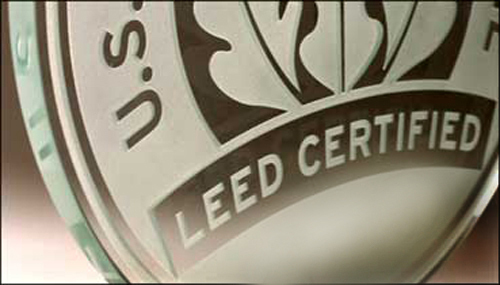 A third force is local enthusiasm for LEED (Leadership in Energy and Environmental Design). Saddlehorn, a development by Bigfork with a strong commitment toward sustainable development, is using the national LEED program as a standard. “Saddlehorn engaged the services of Kath Williams & Associates of Bozeman to ensure that the development and its homes are as green as possible,” said Clint Walker, Saddlehorn spokesperson. Williams has served as past president of the World Green Building Council and is a principal force behind implementing the LEED standards in Montana, nationally and abroad. Saddlehorn is trying for the difficult-to-reach Platinum level LEED certificate for its Welcome House, which according to Walker would be a first for Montana. There are three certification processes for green construction in practice in Flathead Valley. In addition to the new NAHB program that just earned statewide support, there is the federal Energy Star program (US EPA and Department of Energy) and the previously mentioned national LEED program through the US Green Building Council. Homes can certainly be built according to green principles and not be inspected and certified. The advantage of a certification program is that an independent verifier signs off that the conditions for certification have been met. This is a condition for some financial incentives, which is not surprising where money is involved. Incentives to build green are coming from a number of sources. Utilities recognize that conservation is the favored way of gaining supply for their increasing demand. Green homeowners save on water, heating, electricity and maintenance costs, and so qualify for better mortgage terms. State and federal policy-makers have put tax incentives in place, as well. NorthWestern Energy has a handy online calculator for energy use to encourage reduction. Their benefits vary somewhat by service area, but generally include: $30 for a programmable thermostat; $120-310 for high-efficiency natural gas equipment rebates; $100 for a gas convection oven as a replacement; varying amounts for improving boiler and furnace equipment; efficient water measures (water tank insulation, low-flow shower heads, and faucet aerators) rebates or installation complimentary for participating in an energy audit; free weatherization starter kits; varying rebates for switching from electric to gas hot water heating; and a rebate for energy efficient new construction. At Flathead Electric, customers can sign up to purchase renewable energy for $5 per month. It offers the following incentives: a $750 rebate on electrically-heated manufactured homes meeting standards; a $1,000 rebate for new construction or retrofit commercial lighting; $1,000 for air source heat pumps; a ground-source heat pump rebate; $60 for a high-efficiency electric hot water heater; and Energy Star appliance rebates ranging from $25-$70, and including clothes washers, refrigerators, dishwashers, and freezers. There are positive mortgage programs for green. For VA Energy Efficient Mortgages, the VA (Department of Veteran Affairs) offers financial incentives for energy-saving home improvements for the loans it guarantees. With the Fannie Mae Energy Efficiency Mortgages, borrowers can get funds for energy-efficient improvements and add 5% to the home’s value if it is Energy Star® rated. The FHA Energy Efficient Mortgage allows homeowners to incorporate the costs of energy-efficient improvements into their new or refinanced FHA loan. In the tax code, the federal government extended the Residential Energy Efficiency Federal Tax Credit through 2008 for a maximum credit of $500. The IRS also offers the Residential Solar and Fuel Cell Federal Tax Credit for solar and fuel cell systems, including up to $2,000 each for solar electric or solar hot water heating. In Montana, the Department of Environmental Quality offers a guide to save energy. The State offers a 25% energy conservation tax credit, a residential Alternative Energy Systems credit up to $500, as well as substantial help to businesses pursuing alternative energy. Right now, costs for sustainable building materials are going down. Experts in green materials like Dave Fischlowitz attribute it to more and better competition. In addition, with oil costs high, alternative products that are not petroleum based are reaching parity. Fischlowitz says exciting new products are being offered daily: things like solar collecting roofing and windowpanes, and the future should be only brighter. The New York Times Magazine (Oct. 5, 2008) identified world-changing green products now being developed with venture capital funds that will soon be marketed for wind generation and energy conversion and storage. Green building checklists vary by organization, and the checklists can be detailed and lengthy since they specify how the work will be verified. This is a macro list of the concerns that appear on most checklists. While with green building one usually thinks of new construction and homes that pursue certification, this offers some possibilities for those who just want to remodel, upgrade or be more environmentally conscious.